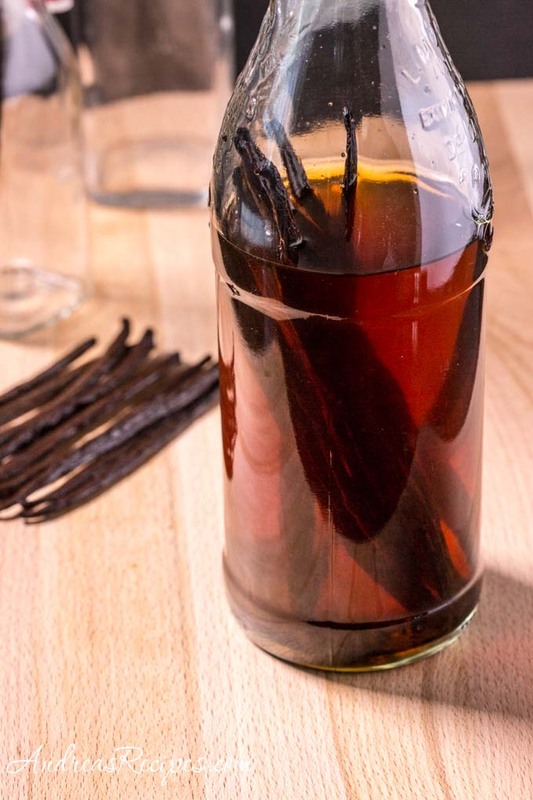 Vanilla beans + vodka + time = vanilla extract. That’s pretty easy math! The process is simple and the equipment list very short: you only need a jar or bottle with a tight-fitting lid. There was a time when I would have said that the biggest part of that equation was the vanilla beans due to their cost, but the Internet is making them more easily and inexpensively available. If you buy beans by the half-pound or by the pound, you can save quite a bit of money. Check out the recommended list of online vendors at the end of this post. The biggest thing you need is time, because the mixture needs to sit for about 8 weeks to reach it’s full potential. However, do not fret thinking that you are too late for Christmas gift giving, because you can start now and include a little note with your gift stating when the vanilla will be ready. It’s like a gift that keeps on giving! And if you plan to keep some for yourself, which you should, you can continue adding vodka and beans to perpetuate your stash. The vanilla orchid plant Vanilla planifolia is native to Mexico but is now grown throughout the tropics, with Madagascar being the world’s largest producer and accounting for 59% of the total world production. Other species of vanilla orchid are also used for production, though the amount of vanillin in each species varies. 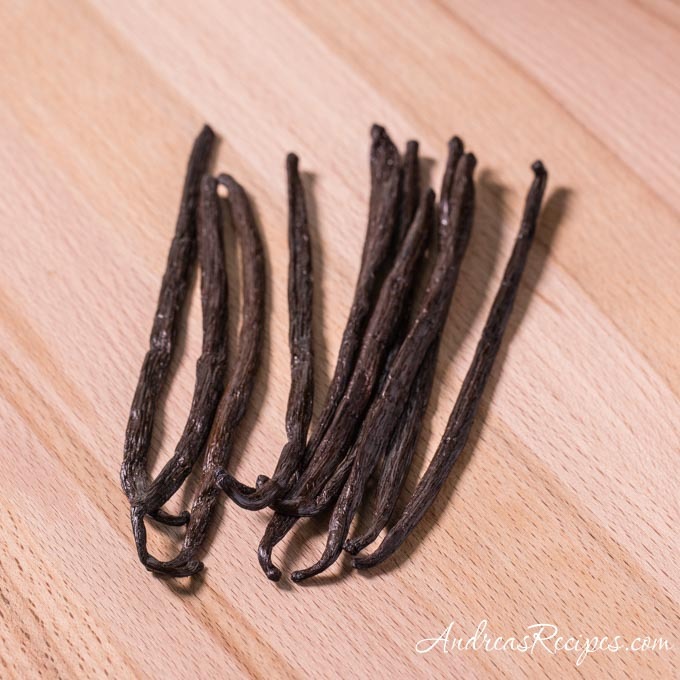 The green pods on the plants do not have any of the aroma associated with vanilla, and the pods are aged for several months before they turn dark brown to black and are considered ready for use. (Additional information added Nov. 7, 2007) Storing vanilla beans is pretty easy, just keep them in an airtight container at room temperature. According to Nielsen-Massey, if stored in this manner, they will keep for at least two years. Do not store them in the refrigerator, as they tend to mold. Making your own extracts, oils, and spice mixes is a fun way to give gifts at Christmas time, and those kinds of food gifts can go under the tree without having to worry about spoiling. This is my contribution to an event celebrating homemade gifts called Spoonful of Christmas hosted by Zlamushka’s Spicy Kitchen (Sweden, gone dark). Cut the six vanilla beans in half lengthwise, leaving about 1 inch connected at one end. Put the beans into the jar and pour in the 16 ounces of vodka. Cover tightly and store in a cool, dark place for about 8 weeks. Give it a gentle shake about once a week. Thank you for publishing this – it’s something which everybody should know! I do it with “spent” pods (ones I’ve scraped the guts from for other dishes), and it works great as well! I just keep on filling the bottle up until I’ve got something which looks like vanilla extract – it’s not a science, but it works quite well! 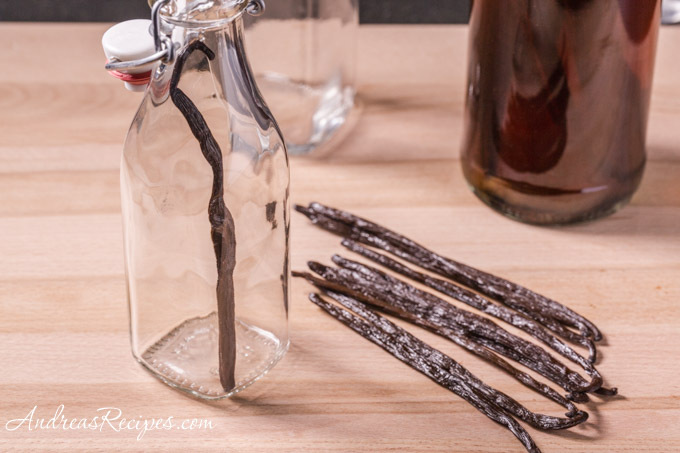 Do you think you could make a nice vanilla vodka the same way? Deb, absolutely, just use fewer vanilla beans, say one for every 500 ml of vodka. For this I would probably scrape out the seeds and use them in something else so that the vodka has a cleaner look. Nice Spoonful Event Idea. I would two versions, as a extract and as a flavored vodka. This is something I’ve always wanted to try, I am not sure where to get the vanilla beans here though, thanks for posting this Andrea! Candace: According to this article I found on OChef, if you store them in an airtight container at room temperature, they will keep for at least two years. They should not be stored in the frig because they tend to mold. Chris: If you can’t find the beans locally at a gourmet food store, you can get as few as 3 vanilla beans (Mexican or Madagascar) from Penzeys Spices. I have done business with this company and have found them to be wonderful! They can be reached via http://www.penzeys.com. Be sure to request their catalog. It is a feast for the eyes! Thank you for posting this! I use vanilla extract in so many things! I’ll have to try this! Brilliant Andrea. Definitely on my to make list. I tend to store my beans in the sugar jars. That way they don’t dry out and you infuse the sugar. Does the liquid actually turn brown like “regular” purchased vanilla extract? Do you have to put the extract through a filter when finished? We’d like to try it! Hi Melanie! Yes the liquid will turn a dark color, and will continue to darken the longer you allow it to sit. I’ve read different opinions on filtering. Personally, I think you filter out some of the flavor, but some people don’t like the sediment. I’ve always wanted to try making my own extract but have never found a sensibly priced source of beans. I’ll check out your links tonight and perhaps indulge myself a little! Do you know how to make almond extract ? Hi Vici! I’m afraid I’m not an expert on making almond extract, but I do know that bitter almonds (not the typical sweet almonds that we find in stores here in the U.S.) are used for making it. Bitter almonds are illegal in the U.S. due to the presence of hydrogen cyanide. The cyanide must be processed out before the almond oils can be safely used. How long can I perpetuate my vanilla extract using the original beans? I have just made a batch in a 750 ml vodka bottle and let it sit the 8 weeks, and I have poured off a 250 ml jar’s worth. I topped up the 750 ml with fresh vodka – I read, somewhere, that you can continue topping up with fresh alcohol and the original beans until the beans stop smelling, is there any truth in this? Hi Christine! You should be able to keep your extract going for a good long time, though eventually the beans will lose their flavor. I can’t find a specific recommendation on when that would be as it would depend on the type of beans you started with and their initial condition. My best guess would be to replace the beans every six months. I’ve read various sources that say you can dry out the beans and grind them into vanilla powder, though I’ve not tried that yet. Not sure how to tell the quality of vanilla beans but Costco sold them for the holday season in 07. They sold 2 vials with 5 vanilla pods in each vial for $10 or $12. I didn’t see them till the end of the season but looks like I will be set to try your recipe in ’08, with lots of time to let the extract brew. Thank you so much for the post on the extract, vanilla vodka, and vanilla sugar. I am currently living in Indonesia and will be here for a couple of years and vanilla beans are plentiful. Now I know what to do with them. Is the vanilla made with the Indonesian bean as flavorful as what I buy back in the States. What can you tell me about Indonesian Vanilla? You can learn more about vanilla at The Vanilla Company’s website. Andrea, you mention vanilla.com. They recently moved to http://www.vanillaqueen.com thought you’d like to know so you an update your website. Thanks Kathy, I fixed the link. If you go on Ebay search Vanilla beans Grade A or B you’ll find them VERY reasonable. I just bought 1/4 pound for $18 gourmet beans (Madagascar). You can buy extract beans for about $8 including shipping. I am living in Tonga currently, and just bought fresh beans from some farmers. I didn’t see any information regarding curing or drying the beans prior to using them to make extract. Do I just use the fresh beans, or do I need to dry them first? Hi Trenton! I’m assuming you have green vanilla beans since you said you purchased them fresh. The beans need to be aged and dried before you can make extract. For more information, check out the” Stages of Production” section in the Wikipedia article mentioned above in References. Does anyone know how to make Almond extract? I can’t find how to any where. Andrea, have you — or has anyone — made vanilla extract with glycerin rather than alcohol? Multiple allergies dictate giving it a go…. I have vegetable glycerin (Heritage Products, Virginia Beach, VA) and the company tells me it’s from palm or coconut, both safe for me. I have made vanilla extract with vodka in the past but must forego that for the time being. I am making some extract for christmas. There is some sediment that is floating in the extract that looks similar to a mold, yet different as well. Should i worry about anything growing in the alcohol? Also do the beans need to be completely covered with vodka? If a small part of the beans is out of the vodka will that hurt anything? Hi Mary Beth. I’ve never made it with glycerin, though I did find a couple mentions about it at eGullet and at Mother.com. Hi Peter. The sediment is the beans from the vanilla pod and is quite normal; in fact, that’s where the flavor comes from. The alcohol content in the vodka will keep anything from growing in the jar. I have a jar of vanilla in my pantry with beans that still stick up above the vodka, and they are doing just fine. You can even pour on a few ounces of vodka between uses to keep the jar going for a very long time. Is Mary Beths allergy to the alcohol, or what the alcohol is made from. There are various things which vodka can be produced from. I know of one released in the past year or two which is from grape seeds, and not the standard ingredients. Someone asked about how long the beans can last. I’m not sure if it’s THE authority on the subject, but I got a kit at TJ Maxx to make vanilla extract (glass bottle with tight, rubber top and 2 or 3 beans inside) and it said to leave the vanilla alone (with vodka added) for 6 months, then add vodka to replace used extract for up to 7 years. How does that sound? By the way… my vanilla extract has been put up for about 3 weeks. I just used it to make a cocktail, 1 oz. vanilla/vodka with 1 oz. frozen gin, shaken and “bruised”, and it’s wonderful!!! Hi, Andrea! Thanks for posting this. I have a question—I have a question similar to Mary Beth. I have a sediment floating in my homemade vanilla that is NOT the beans, or at least, it’s not just the beans. In the bottle it looks lightish in color. I fished some out with a fork, and it was more vanilla in color, and kind of gelatinous. I’m not sure how to describe it. What do you think that is? And the vanilla doesn’t look very clear. I was going to give this as a gift to a friend, but now I’m afraid to! Hi JenR. Since I’m not there I can’t say for sure what might be floating in your extract. If you are concerned, you can strain it through a coffee filter. Found this site thought it could add some additional information. I tried it, it doesnt have any aroma and the dark color. i used 3 beans and a small bottle. It”s been 5 months since i make it. Hi djenny. I have never run into this problem so I’m going to ask a few questions. Did the vodka have a low alcohol content? Did you split the beans before putting them into the bottle? With all this conversation about making vanilla extract, I was wonderingif anyone had ideas where “bottles with tight fitting lids” could be purchased to give as gifts? Hi Maureen. By tight-fitting I mean a good screw cap or a pressure cap, such as one of those swing types with the rubber stopper. I’ve even started saving screw top bottles of sparkling cider from the holidays and using those. They clean up easily, seal well, and look nice.